Ever seen young people swiftly jump on and climb buildings? They seem so well-trained that they don't hesitate to do it. 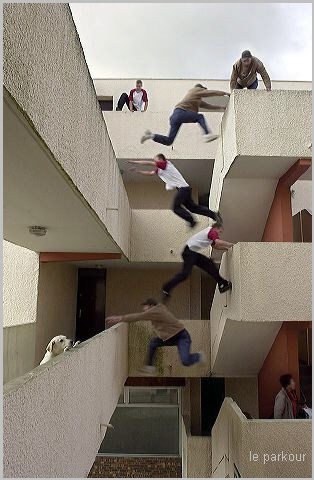 What they do is called parkour, while the practitioners are called traceurs (male) and troceuses (female). According to the American Parkour Website, parkour is the physical discipline of training to overcome any obstacle within one's path by adapting one's movements to the environment. The obstacle can be anything encountered in the environment, including skyscrapers and rails in urban areas. The aim is to get from one place to another using only the human body and the object in the environment. Parkour itself is a physical discipline originating in France. It was David Belle, a Frenchman who introduced this extreme sport to the world. But long before that, in the 19th century, Georges Hebert was inspired by the African tribes — who were good in athletics and gymnastics — to develop a training method that could release human's inner energy. Georges found out that it was the environment that made people what they were. So Herbert invented a training system called natural method with the motto "Etre fort pour etre utile" or "To be strong in order to be useful." This training method was used by the French army in the Vietnam War. One of the army members was Raymond Belle, the father of David Belle. David developed the method into parkour that we know today and spread around the world, including Indonesia. Now, we can parkour communities in many cities in our country.